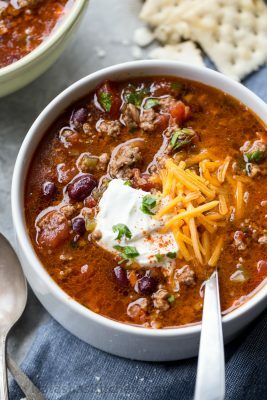 This rich and hearty homemade beef chili recipe loaded with vegetables and beans is comfort food at its greatest! Brown beef in a Dutch oven over med-high heat, breaking up the meat while stirring. Add onion and cook until tender. Add diced carrot, bell pepper and minced garlic. Cook until vegetables are tender, stirring as needed. Drain excess fat. Pour in diced tomatoes with juice, add beans, broth and seasonings. Stir well to combine. Turn heat down to a gentle boil and allow chili to cook 15-20 minutes, stirring occasionally (longer if meat and vegetables aren’t desired tenderness). Taste chili and additional seasonings if needed. Turn off heat and allow chili to rest 5 minutes.